Get to know the ceramicist! Behind unika:k's collection of handmade ceramics you find a number of dedicated ceramicists. By clicking on designers on top of the website you will find our list of ceramicists. Choose on of the persons and read about his/her dedication to the field of handmade ceramics. Being interested to hand-thrown ceramic and porcelain, you might find it interesting to learn what inspires the ceramicists. unika:k admires these incredible ceramicists who through their unique products tell a very unique story and we are thrilled to hear about it. Handmade - with love! At unika:k you will only find porcelain and ceramics that are hand-thrown with care by some of Denmarks most talented and dedicated ceramicists. We proudly garantee that by choosing a hand-thrown product from unika:k you also get a product that is filled with a unique story that have love, 100% soul and happiness in it! The ceramicists are involved in the whole process from the first thoughts and ideas - to design - to the hand-thrown production - and at last till the products leave the working spot. Our collection is known by the fact that both the design and the production is pure Danish. Danish ceramicists have had their hands in the clay for many decades! In other words the Danish experience within the production of porcelain and ceramic products is considerable large and uundværlig. 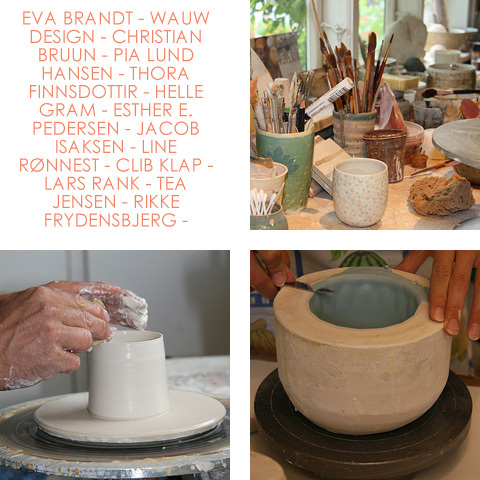 Danish ceramics and porcelain are popular all over the globe and new talented and gifted ceramicists bloome every year. Therefore we support and admire these talented ceramicists who choose to hand-thrown their porcelain products. Every product is made with love and passion for well-craftet designs. Handmade or hand-thrown at unika:k means that the product is a result of the ceramicists creativity and expertise in the process of both design and production. Every product has its own unique touch of handmade porcelain and ceramics.